Yesterday was an atypical day for my museum activities. Dave Willard had taken out several frozen bags of Yellow-bellied Sapsucker skins. These were birds that he had removed all of the viscera from, but never had the chance to stuff and mount. They had been sitting in the freezer for almost a year. There just isn't enough help and hours in the day, and so this is not unusual for things to sit around for a year or two before someone can get to it. I thawed out the sapsuckers in water, dried the feathers without drying out the skin too much, and then stuffed them. For skins that had been in the freezer for so long, they came out quite nice, and there was something satisfying about seeing a couple of rows of mounted specimens of a single species. You could really notice the subtle and not so subtle variations in plumage. I wish I had remembered to bring my camera. Many of them were young birds that were in the process of molting. I was there for 8 hours and managed to get through 12 of them (there are 22 total), and so will probably finish up the remaining skins next week. I was tempted to finish the last 3 of the 15 Dave had taken out that day, but when 4:30 rolled around, I thought of the northbound rush hour traffic, the 70+ degree weather outside, and called it quits. I've done a painting of sapsuckers before on this blog, but wasn't really happy with it, and so here is a new one. Sapsuckers don't breed in this area, and are just passing through thank you very much. I've seen multitudes of them in Field collections, but have yet to see one in the field. 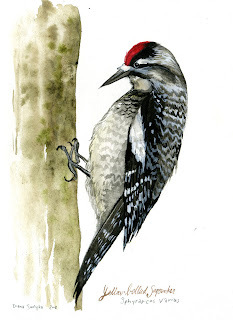 This painting is of a female, as she lacks the red throat patch that the males have in addition to the red on the crown. Your job at the Field is so interesting! You MUST take your camera with you at all times and show us more of what you do there.